If you have the need to track mileage across various clients and jobs, Mileage Tracker will meet your needs. With Mileage Tracker users can add unlimited number of mileage entries to be associated with different jobs, while each job is associated with a defined client. Enter your mileage either by entering a starting odometer reading and ending odometer reading. You can also enter mileage by entering the total distance traveled. Track the date that the mileage was executed. Associate multiple tags to the mileage entry to quickly identify the reason for the trip. Additional information about the mileage entry can be captured within the notes field. Payment management - as customer payments are received, they too can be tracked within Mileage Tracker. These payments as well as due dates can be used to auto calculate job statuses. Collected data is able to be exported in a CSV format for import to other applications such as ExcelTM and Quick BooksTM. 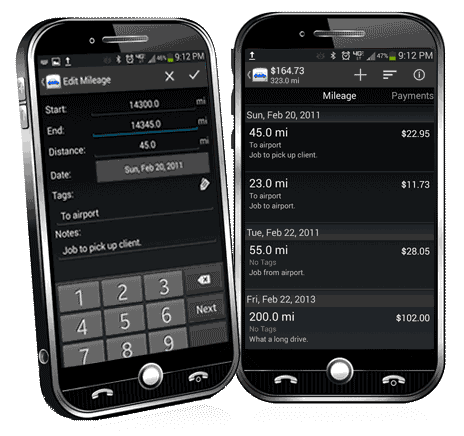 Mileage Tracker is a great application for keeping track of mileage that you have travelled while servicing a client. Most applications charge hidden fees through the use of their servers for report generation and billing; not Mileage Tracker. There are no additional charges beyond the purchase price of the application. If you already have the Mileage Tracker application and you would like to add time tracking or expense tracking capabilities, see the Time Add-On and Expense Add-On items.